The compression ratio for the Aerovee is set on the basis of 55cc head volume (I measured them to be 53). I got a pair of new Revmaster heads instead of the hopeless "Mofoco" head from Aeroconversion (if my sets of heads were just a bad batch, I don't know, but the Revmaster heads are like a Swiss watch in comparison). The volume of the Revmaster heads are 68 cc. This means I cannot use the table in the manual to set the correct shims. I also have the Great Plains manual, and I used the procedure to measure and calculate CR there. Measured deck height is as described in the Aerovee manual. I will go for the closest to 8:1 from the lower side. 2cc head volume difference doesn't seem like much, but it represents a difference in CR of 7.94:1 for 55cc and 8.13:1 for 53cc for the same shim sizes. This had me thinking. Why are the Revmaster heads 68 cc while the "stock" heads are 53-55? Did some googling, and the only reason I can find is the reduced squish band. The squish band is the flat area round the "dome" of the combustion chamber and it's distance to the piston at top dead center. Reducing this will increase detonation margins and generally improve the combustion process. This is done when the piston "squishes" out the mixture in the squish band into the center of the combustion chamber. This causes lots of turbulence, which improves the combustion and decreases the possibility for detonation. The Revmaster head are simply put a whole lot better. When calculating this band for a "stock" Aerovee head and a Revmaster head, the band for the Aerovee is 3.8 mm while it is 1.5 for the Revmaster (at CR = 8:1). 3.8 mm is (according to Google :-) ) not nearly enough to cause any "squish" at all. Then another small problem came up. 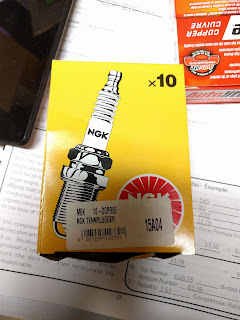 The Revmaster heads have the second spark plugs at a different angle than the Aerovee. 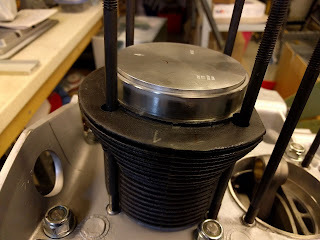 The are drilled so that only a spark plug with 16mm hex will fit. The Autolite plugs have 18 mm hex, and the cup for the 18 mm hex is too large. Revmaster use the NGK DCPR7E. This is a 16 mm hex variant of the NGK DPR7E which is (almost) a direct replacement for the Autolite 4163 (used by Aeroconversion). The direct replacement is the one notch "colder" DPR8E. I went to the local "Mekonomen" and they had exactly what I needed, the NGK DCPR8E. Maybe with the Revmaster heads (and all the squishing) I will need the "hotter" DCPR7E, but starting with a slightly colder plug is always safe, while a hotter may not be.